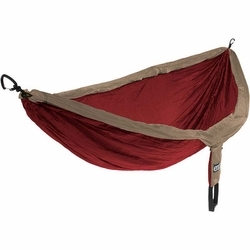 Eagles Nest Outfitters Double Nest Hammock, now with built-in insect protection. Using the eurable and effective Insect Shield® treatment, the ENO double hammock will repel insects through 6 months of exposure to the elements. With room for two, the Doublenest is great for family outings or just relaxing in the backyard. The Doublenest packs down to the size of a grapefruit, so there is no excuse to be without it. Eagles Nest Outfitters. Dimensions: 6' 8" x 9' 10"